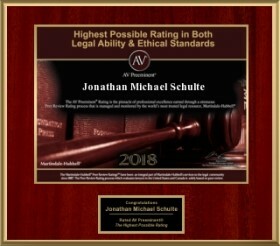 Attorney Jon Schulte provides a wide range of service to Kentucky and Indiana clients including bankruptcy, creditor representation, debtor representation, family law, criminal defense, estate planning, business law, and probate. He also provides local appearances on behalf of counsel residing outside the Southern Indiana/Kentucky area. Much of Mr. Schulte’s practice is devoted to creditor/debtor relations with a focus on foreclosure defense and foreclosure plaintiff’s work. On the defendant’s side, he helps clients evaluate their options and will ensure the foreclosure procedures have been undertaken properly. On the plaintiff’s side, he ensures the plaintiff’s legal rights are enforced swiftly. Mr. Schulte also helps clients file for bankruptcy protection under the Federal Bankruptcy Code in Kentucky and Indiana. Prior to joining the firm, Mr. Schulte was an associate with one of Kentuckiana’s largest creditors’ rights firms for more than two years. This experience enabled Mr. Schulte to understand the creditor/debtor dynamic in great detail. 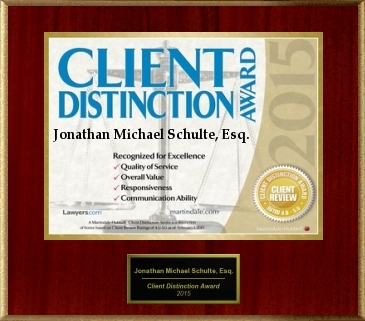 Mr. Schulte’s practice is also devoted to family law. In this area he represents clients concerning divorce, custody, visitation, parenting time, child support, paternity, and adoption matters. His estate planning practice is focused in helping clients identify and document their wishes not only for the distribution of assets after death, but also how they should be cared for in the event of incapacitation. Once these wishes are known, Mr. Schulte prepares the applicable estate planning documents, which often consist of a will (or a will and trust), a living will, and a healthcare directive and power of attorney. 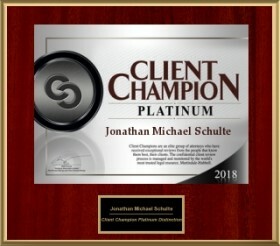 In his business practice, Mr. Schulte helps clients with business formation (including LLC’s and corporations), general contractual matters, and corporate compliance. He is also available to litigate matters in the event of a business dispute that cannot be resolved. 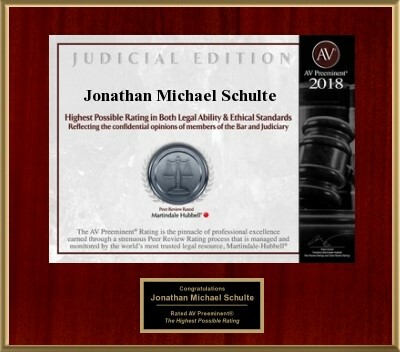 Jon has received an AV Preeminent© peer rating from Martindale-Hubbell. 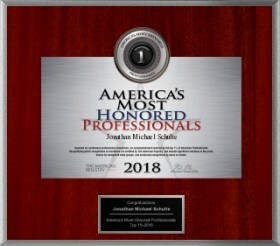 This rating signifies the highest level of professional excellence by Martindale-Hubbell’s rating system, and is based on a peer review of a lawyer’s legal knowledge, communication skills, and ethical standards. I serve clients by adding a level of comfort that their matter is in capable and experienced hands. Clients know that as soon as they entrust me with their matter, I will begin immediately working on their matter and on developing a strategy towards achieving a favorable result to the extent possible given the circumstances of their matter. While no attorney can promise a “win,” clients expect, and I provide, a solid effort on every matter. Another hallmark of my representation is accessibility. When clients call, I answer. When I’m not in the office, I return calls as soon as possible. My practice does not involve multiple gatekeepers who screen calls, or multiple professionals billing on a client’s matter without their knowledge or consent. This system ensures that clients will have full attorneys access, and that fees will be managed in the interest of clients. Jon is a speaker for the Louisville Bar Association’s “C.A.R.E” program that educates local high school juniors and seniors about the pitfalls/benefits of credit. He is also a member of the Indiana Pro Bono Bankruptcy Commission, and volunteers at the Clark County, Indiana legal help desk. Mr. Schulte feels it is a civic duty for attorneys to make legal counsel accessible to those in the community who cannot afford legal representation. Mr. Schulte is also a Louisville Legal Aid Apprentice (2015).